The Loveland Habitat for Humanity ReStore is looking for great volunteer groups and individuals to give back to the community in a fun retail environment! 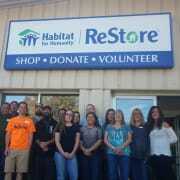 ReStore volunteers support Loveland Habitat’s mission to provide decent and affordable housing to lower and middle income families and individuals. Volunteers help process and arrange the donated merchandise; whether it be clothing, furniture, housewares, books or electronics. We are always looking for great sales associates to help customers and donors on the sales floor and in our receiving area.